I first titled this post “Molecular Gastronomy Class”, and began adding a few photos and information links to molecular gastronomy cookbooks, chef info, “where to buy” ingredients and video clips. I figured I would wake up this morning and finish writing about my “molecular gastronomy class” and then add recipes and photos from the fun day. Then I noticed there was a comment pending and was shocked to see it was from Hervé This, the French scientist recognized as THE FATHER of “molecular gastronomy”. Woa. First of all, I am very honored that you took the time to write me, and I thank you for your forthright comment. “Molecular Cooking” (as I will now call it) is an exciting new world to me and I appreciate you taking the time to correct me. I have added a video link to the “Gourmet’s Diary of Foodie” episode featuring your discussion on molecular gastronomy, and have also renamed my original post, “Adventures in Molecular Cooking”. The class began with Chef Michael Young explaining the basics of Molecular Gastronomy, and asked if any of the sixteen students present were familiar with Chef Ferran Adria and his el Bulli restaurant. 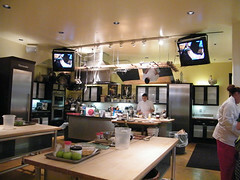 As we all shook our heads “yes”, Chef Young pointed us to the monitors above the kitchen. The dvd playing was one of my favorite Anthony Bourdain segments, called “Decoding Ferran Adria”. It’s a detailed behind the scenes look at the el Bulli taller (labratory) and el Bulli restaurant. I’ve watched my own copy of dvd at least twenty times over the years. 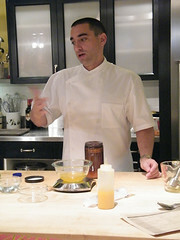 As Chef Young continued talking about molecular gastronomy, he noted that Hervé This (whom Chef Young had met before) was first and foremost a scientist, NOT a chef, and that the experiments we were using in the class were first made famous by This, and adopted by Ferran Adria for use at el Bulli. 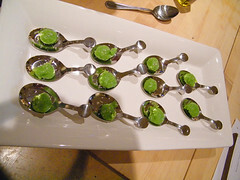 One of the recipes featured on the dvd was called the “Pea Ravioli”, also known as the “Spherical Ravioli”. Ferran & Albert Adria chose the name “because the sensation in the mouth was precisely that of a liquid ravioli”. I’d been dreaming of this one-bite dollop for years and was so excited it we’d be making it today. Ferran Adria’s Pea “Ravioli” with Black Truffle Oil. “Pomme d’Amour” (Michel Richard’s Candied Apples). Olive Oil Poached Halibut with Porcini Mushroom Foam. Beef and Jicama Sashimi with Tarragon Emulsion. My nephew Cody and I wanted to make the Pea Ravioli, and Peter (my husband) chose the Candied Apples. “Team Ravioli” included myself, Cody and a very nice mother and son duo from Alabama. Peter joined another couple in making up “Team Apple”. Note: We (Cody, myself and Peter) didn’t work on any of the other recipes (duck, halibut or beef) so I will only discuss the two we focused on during the class (the pea ravioli and candied apples). 1. Mix the sodium alginate with 1/2 of the pineapple juice and blend till completely dissolved. 2. Mix in remaining juice, straining and allow to sit to remove any air bubbles. 4. Fill syringe or a squeeze bottle with the juice mixture. They were delicious little balls of pineapple fruit “caviar” and it was fun to see how easy this molecular cooking was going to be… or so I thought. 1. In a shallow baking dish, combine water and calcium chloride. Whisk until calcium chloride is dissolved, then store in the fridge to chill. 2. Blanch frozen peas in salted, boiling water, then shock immediately in ice water for several minutes. Drain. 3. Using an immersion blender, rain the sodium alginate into the cold water, until fully dissolved. The water will thicken considerably. Bring to a boil over high heat, stirring constantly. Remove from heat and allow to cool to room temperature. 4. When cooled, blend with peas, add chives and mix until the mixture is smooth. 5. Remove chilled calcium chloride mixture from the fridge. Scoop pea mixture into a tablespoon measure in the shape of a half-sphere. Set the bottom of the tablespoon measure against the surface of the calcium chloride mixture, then pour the mixture in the calcium bath. Leave ravioli in the calcium chloride mixture for two minutes. 6. 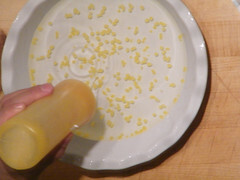 Gently remove the ravioli from the calcium chloride bath using fingers or a slotted spoon. Place in a shallow bowl filled with cool water, to rinse calcium off the ravioli sphere. 7. Top with a few drops of truffle oil and sea salt. Serve immediately. After reading the “Pea Ravioli” recipe, my nephew Cody and I took charge and started working. First weighing the calcium chloride on a digital scale (which took us a few minutes to figure out! ), then on to blanching the peas. 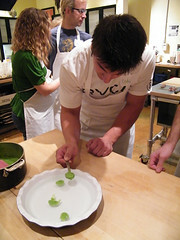 The kitchen was VERY crowded with sixteen students plus a staff of three all trying to maneuver equipment and burner space, but it was FUN. 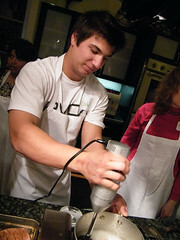 After we mixed and chilled the calcium and shocked the peas, Cody grabbed an immersion blender and went to work on the sodium alginate. He brought it to a boil over high heat and then allowed it to cool. The next step was blending the sodium alginate with the peas, and at that point we realized that the other members of “team ravioli” had only been watching. Unlike myself and Cody, the sweet “Alabama” mom and son duo were sort of unsure and afraid to jump in and get dirty. So we motioned them to come over and they blended the pea mixture with the sodium alginate. And that’s where things sort of took a wrong turn. It wasn’t mixed enough. The pea mixture was supposed to be SMOOTH… silky smooth. Cody and I both knew that because we had watched the el Bulli video. But OUR pea ravioli mixture was well… a little lumpy! Alabama insisted that it was mixed enough and since it was a “team” recipe effort (and I didn’t want to get into an argument), we moved on to the next step. We transferred the chilled calcium chloride from the fridge to our work table and scooped out tablespoon size balls from the bowl of peas & alginate. It really was too thick… but as we maneuvered the pea mix into the calcium bath, they instantly firmed up and turned into “balls”. Thick, lumpy balls (most with little tadpole-like tails) but they held together! We all took turns making the pea ravioli…. each trying to get the spoon out WITHOUT creating a tail on the ball. Students from other groups came over and gave it a try. Next we drained each ball in fresh water, then Cody and I got busy plating them up on a square platter. We drizzled a few drops of truffle olive oil on each, then topped with crunchy sea salt. How did they taste? They were delightful! Firm on the outside, sweet and creamy on the inside, and of course the truffle oil and sea salt added extra flavor and texture. Our Pea Ravioli spheres were definitely NOT perfect, and honestly it was PERFECTLY fine with me. How else would we learn if our recipes came out flawless the first time? 1. For the candied apples: In a medium saucepan bring sugar, citric acid, glucose and food coloring to 310 degrees Fahrenheit. 2. Remove from heat. 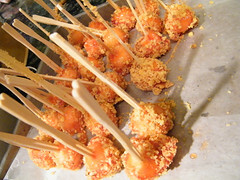 Insert toothpics into apples and immediately dip into candy. Place apples on bed of crushed corn nuts. My husband Peter said he had a great time making the Candied Apples, especially because we are big fans of Michel Richard. They were bite-size, sweet and crunchy from the corn nuts. The three of us throughly enjoyed the afternoon class, although I wished we had a few more hours to play! Chef Young was super friendly, helpful and I’ll be the first to sign up when he teaches another “Molecular Gastronomy/Cooking” class! Infusions LTD sells an el Bulli “mini starter kit”. May I tell you that you make a confusion. I and Ferran are doing completely different things. For me, it’s science, and not cooking. For Ferran, who began using my books and others, it’s cooking. And it’s called “molecular cooking”. 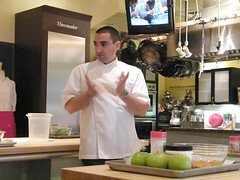 Mind the fact that gastronomy does not mean “luxury cooking”, but rather “reasoned knowledge”. And chefs don’t make science, only technology sometimes. First of all, I am very honored that you took the time to write me, and I thank you for your forthright comment. “Molecular cooking” (as I will now call it) is an exciting new world to me and I appreciate you taking the time to correct me. how amazing that he took the time to point out a common mistake. 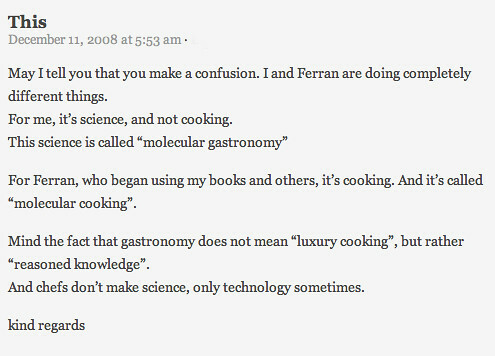 thank you for posting this b/c i am now clear on the difference between molecular gastronomy vs. molecular cooking. it really is a fascinating comment he makes and the world of molecular gastronomy vs. cooking is something I basically am blown away by. my dream is to experience it in the flesh one day! While this seems so incredibly unattainable to me, my attraction to it never wanes and I continue to cling to the hope that some day I might enjoy a meal like this. “A Day at El Bulli” sits under my tree, wrapped – or so go my assumptions. I can’t wait to read it and enjoy the experience, if nothing else but on paper. I’m so jealous! It looks like a really fun class to attend. I just read Molecular Gastronomy by This this summer. 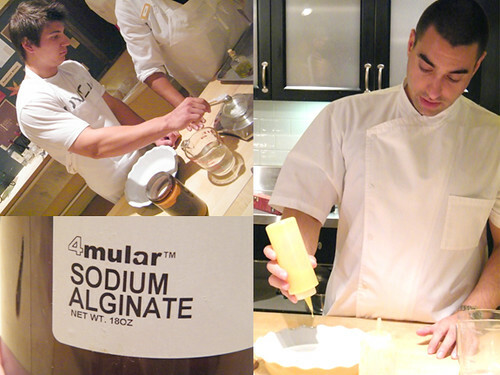 I wish the Sur la Table had classes in Dallas on molecular cooking! Hey there, I’ve found your site on Yahoo, it’s really interesting. I surely will be back later to check things out again. Keep up the good work! You have assembled an awesome article here, I have spent an hour and barely scratched the surface. lol While the techniques are fascinating, I wonder about how you would describe the tastes and textures as you ate the finished product. 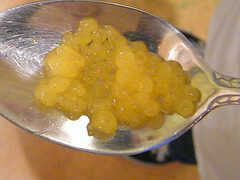 For instance, was the pineapple “caviar” concentrated as it hit your tongue? Did the flavor linger? How about the pea ravioli, I am sure the taste was incredible, did you experience a sense that the pasta was there in your mouth even though it wasn’t? As I watched the Pea Ravioli video I got the sense that this is almost fooling the senses as the flavors explode in the mouth. Using rosemary to simply smell while eating, the appearance of dirt with the chocolate plate, or the snowball ice dessert. By the way I really want one of those Vitamix XL’s from Le Sanctuaire! Thanks for sharing this post, I’m just beginning venture into molecular cooking!